We’ve had a couple of days with gloomy weather, but the sun will eventually come out so we can go out and play in the Austin summer we love so much. In the meantime, we wanted to give a shout out to the wonderful clients who provide us with reviews and feedback. This is essential in helping create a better and more customized service for you, and we appreciate the praise (As well as some constructive critisism). 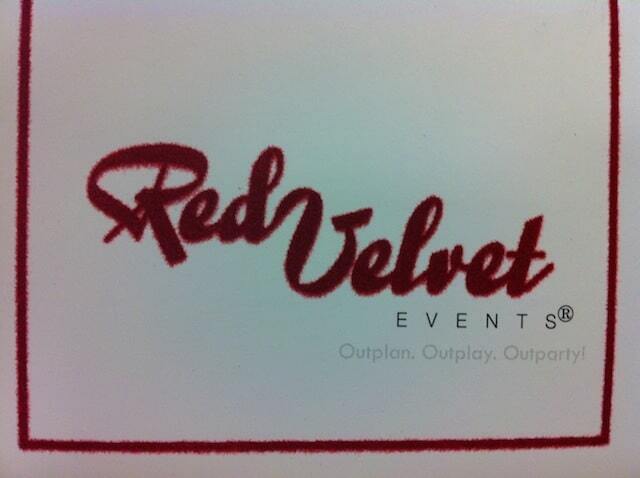 Here is a post from an event we did last year, thanks again! You want a caterer committed to dazzling your guests on your wedding day: choose Crave! Every member of their team went above and beyond our expectations to suggest a creative menu within our budget, execute it with skill, serve it with imagination, and attend to our guests with genuine care. From our first phone call, Meredith Pollard was not only interested in our business, but interested in US–taking time to understand the flavors, the vibe, the variety we were looking for in our menu and overall event. We immediately knew we were in good hands. She easily met all the requirements of our outdoor venue; made smart suggestions about staging, timing, and presentation; and was flexible with every change that popped up and well-coordinated with every vendor we engaged. This was so helpful since we were planning this wedding from a long distance: all phone calls and emails to Crave were prompt, professional, and pleasant. The tasting was delicious party in itself. And on the wedding day, Crave showed up with an A-team of top-notch chefs, servers, and bartenders, making everything flow smoothly and wowing every guest with the range and quality of unusually good food and drink. Every part of our menu–from the oyster shooter appetizers to the tilapia tacos to the late-evening watermelon mojito popsicles on the dance floor–was a huge hit and an amazing value. Meredith overlooked no detail from start to finish: including personal servings and getaway boxes for the bride and groom. No question: for a 5-star reception, count on Crave! In an effort to make sure we never miss an opportunity to refine our service, we request feedback from all our clients after their events. We value all opinions and treat every day as a potential learning experience. The samosas were even more delicious then I remembered!! Had a lot of people coming up to me saying the grilled cheese with tomato basil soup shot was perfection! Several people said it was the best food they had ever had at a wedding. Portion sizes were just right. Service was also great. They were attentive, professional and efficient! I said I didn’t know, Crave is just epic like that I guess. I hope I have to throw another party so I can hire y’all to cater again! Nancy- It was such a pleasure working with you and your daughter on her special day! A big congrats to the newlyweds! Hey Crave blog readers! 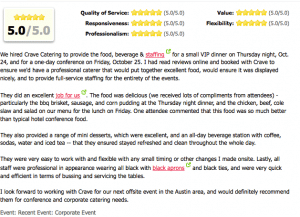 For the past 10 years, we have been recognized for our catering services by the Austin Business Journal and we couldn’t be more proud of our dedicated team here at Crave Catering. Without the passion, dedication and work ethic our Crave family brings to the table every single day, we wouldn’t be able to accomplish any of the countless (but always remembered) weddings, events, corporate gatherings, open houses, soirees and everything in between! We want to thank all of our past clients for keeping us at the top of our game, inspiring our culinary creativity and allowing us to keep serving you during your special occasions. Here’s to another ten years! This is our plaque from last year, but are looking forward to receiving this years! One of our first weddings of 2014 and it looks like our client was happy with our service! 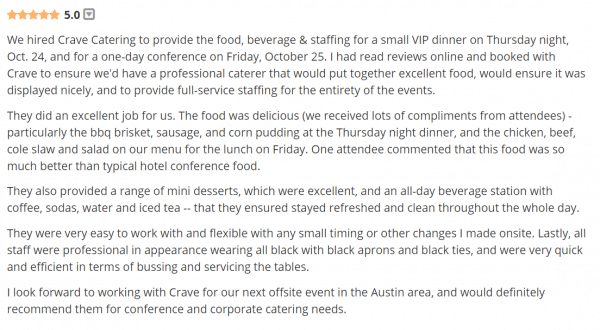 Crave Catering works hard with our staff of cooks, servers and planners to make sure we bring you exceptional service. A big thanks to all our clients, you are so very special to us! “Meredith, Kacie, Chef Adam, and everyone at Crave was amazing! Top notch, for sure. I planned my Austin wedding from New Jersey, and I could not have asked for a better experience. My wife and I had an initial conference call with Meredith to discuss our likes and needs for our wedding. Then, she presented us with three sample menus and pricing. We tweaked the menu with a few phone calls and emails before finally settling on our menu. My menu was amazing. I even asked for an appetizer that was not on their menu, and there was never even an eye batted about the request. It was very seasonal and fresh. One of the best things about the food was that it was not heavily or overly sauced. 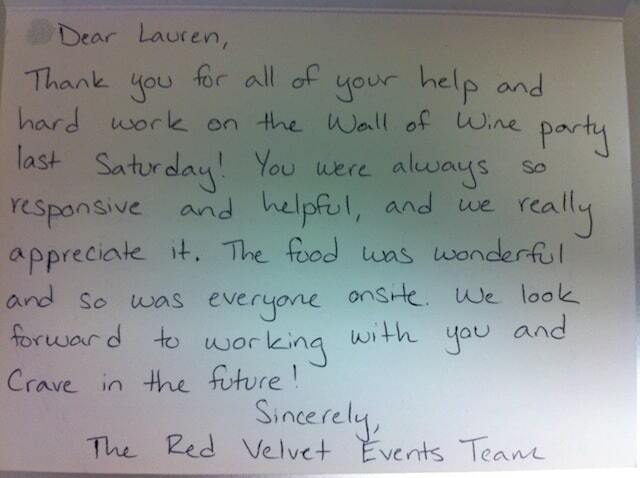 During the event, the staff was unbelievable. They were right where we needed them, right when we needed them. They were great to ensure our families got to go through the buffet first and invited people to the buffet by tables so that the buffet lines were not excessively long and the whole process was orderly. My guests appreciated that. The staff was so responsive to our guests – even going so far as to share their recipe for Mac-n-cheese fritters with my dad!